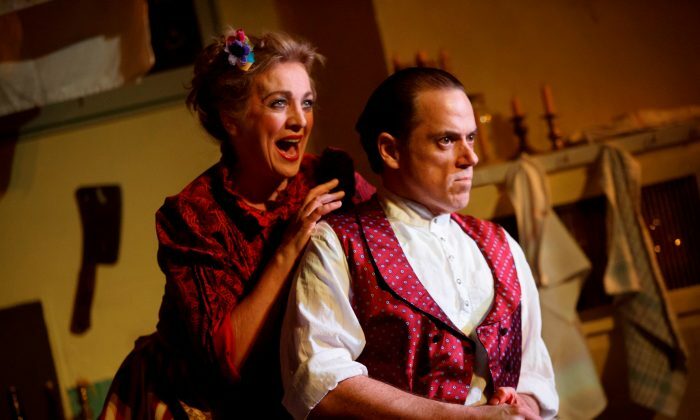 NEW YORK—Ghosts from the past return demanding vengeance in the 1979 Tony-Award winning musical “Sweeney Todd: The Demon Barber of Fleet Street.” The current U.K. production, now at New York’s Barrow Street Theatre, allows the audience to get very up close and personal with the story. With meat pies hot and fresh and a scintillating production so small, you can literally reach out and touch the characters. The entire musical is enhanced by its presentation as a wonderfully laid out, site-specific production. 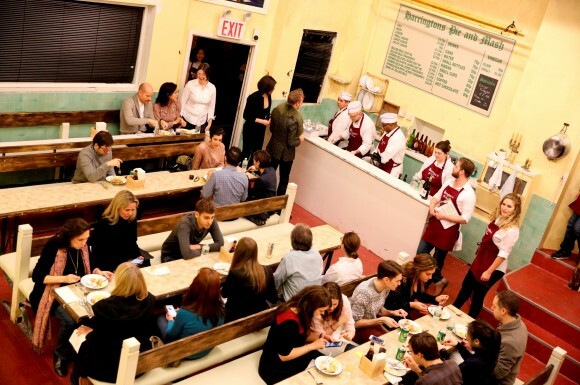 This particular revival begins at Harrington’s Pie and Mash Shop—established in 1908 and the oldest continually operating shop of its kind in London. Much of the audience sits on benches running the length of a series of long tables. This allows the actors to walk and sing atop them and indulge in several bits of audience interaction. Escaping an Australian penal colony where he was unjustly sentenced 15 years earlier, Sweeney Todd (Jeremy Secomb), a former barber by trade, has returned to London to exact revenge on those who tore him from his wife and infant daughter. The main subjects of his wrath are Judge Turpin (Duncan Smith), who had him sent away because he wanted Sweeney’s wife for himself, and Turpin’s accomplice, the constable Beadle Bamford (Brad Oscar). Upon reaching his former home, Sweeney finds it occupied by a run-down pie shop. 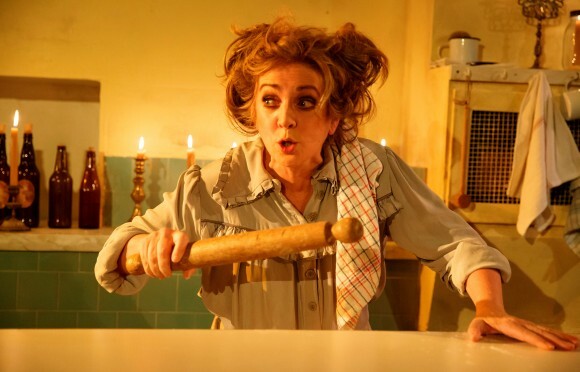 According to the proprietor, the widowed Mrs. Lovett (Siobhan McCarthy), the shop makes “the worst pies in London”—a point she emphasizes in song while Sweeney offers an absolutely priceless expression as he bites into one of them. Secomb gives an utterly brilliant performance. Using the tools of his old profession, Sweeney sets himself up as a barber of some renown, all the while planning for the day when those he most despises will visit his chair. However, when he is forced to kill to protect his secret, Mrs. Lovett proposes that instead of burying the body, they use it for meat pies. Sweeney gleefully agrees. In almost no time thereafter, Mrs. Lovett’s shop becomes a great success, with the pies being devoured as fast as they come out of the oven. However, despite Mrs. Lovett’s pleas to Sweeney for caution, his desire for revenge continues to grow. Matters gain urgency when the Judge decides to make Johanna his wife—despite the fact that the young girl has having fallen in love with a sailor named Anthony Hope (Matt Doyle). Book writer Hugh Wheeler and composer Stephen Sondheim have constructed a masterful morality tale, which warns of the dangers of blind vengeance. With “Sweeney Todd,” book writer Hugh Wheeler and composer Stephen Sondheim have constructed a masterful morality tale, which warns of the dangers of blind vengeance. The theme is evident in Secomb’s utterly brilliant performance. His face is alive with the light of madness, his entire body on a continual hair trigger, and woe to anyone who gets in his way. Sweeney even thinks nothing of using his own daughter as a pawn to bring the judge into his clutches. McCarthy as the duplicitous Mrs. Lovett initially comes off as something of a flake, but her outward demeanor conceals a powerful determination for love and prosperity. She willingly uses everyone she meets in order to achieve her goals, including the trusting lad Tobias (Joseph Taylor). McCarthy does a wonderful job bringing out the different sides of this quite devious yet often endearing character. Finke and Doyle are quite appealing as Johanna and Anthony. Their characters’ innocence offers a counterbalance to the evil surrounding them. And lending an intriguing presence is Betsy Morgan as a mysterious beggar woman. Helping the show’s creators get their messages across is Sondheim’s thrilling score. Though words do get lost at times, even with only a three-piece orchestra, most of the songs come through beautifully, particularly “A Little Priest.” Its lyrics gleefully swipe at the corrupt and privileged of the world. Also quite good is the haunting “Johanna” and the rather ominous opening number. Greatly adding to the production’s overall impact is the excellent work of director Bill Buckhurst and choreographer Georgina Lamb, both making maximum use of the “less is more” axiom in this relatively small but supremely effective space. A tale of vengeance wrapped in a morality lesson, this production of “Sweeney Todd” is an altogether satisfying meal.